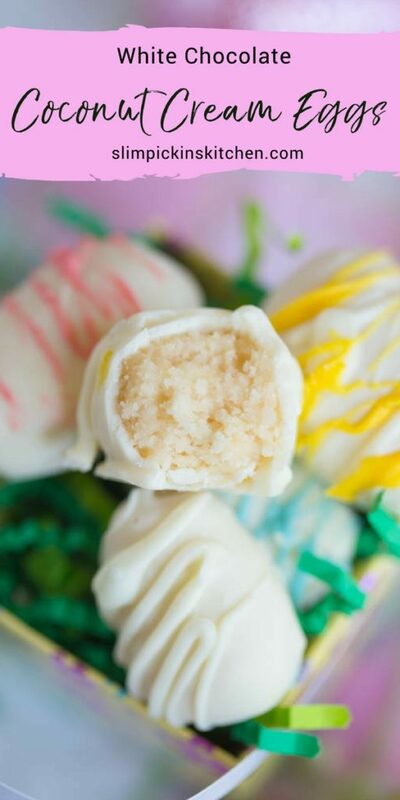 White Chocolate Coconut Cream Eggs are an eggscellent, clean eating sweet treat that you won’t feel bad about serving to your kids! Tropical, unsweetened coconut is blended with thick coconut butter, coconut oil, sweet honey, and a kiss of vanilla making these a delicious and decadent dessert that’s practically good for you! Nothing quite screams spring to me more than a lovely batch of homemade Easter candy. For years our Easter holiday has been loaded with massive peanut butter and coconut cream eggs meticulously made by the members of my in-laws church and the homemade butter cream eggs my husband’s aunt blankets her house in during her annual family Easter egg hunt. Also at that Easter egg hunt? Buckets upon buckets of Easter candy loaded with GMOs, high fructose corn syrup, and any color of food dye imaginable. 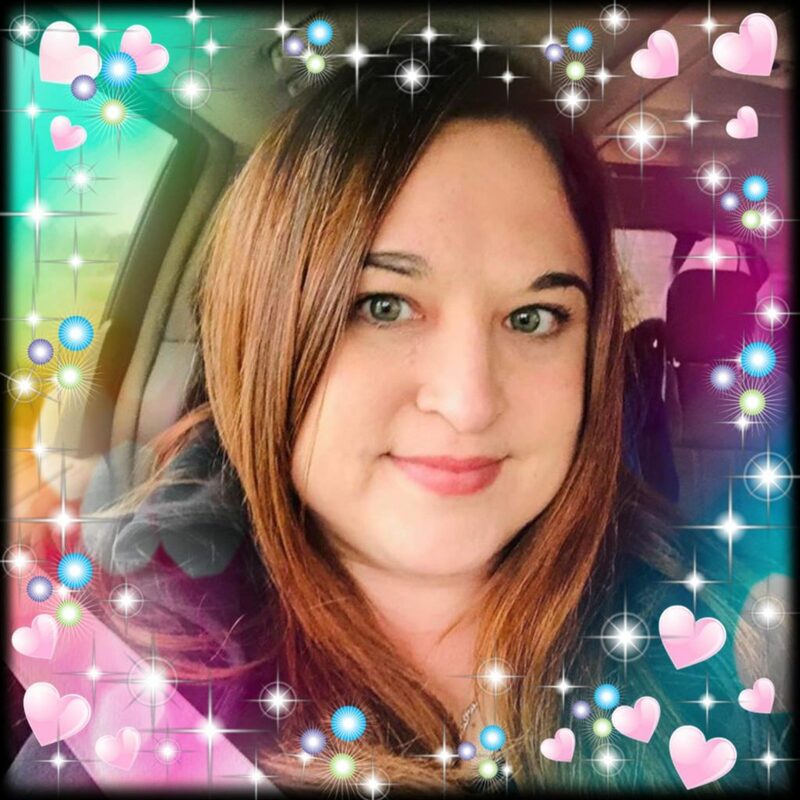 Don’t get me wrong, I will totally eat a handful of jelly beans or three, I just don’t want my four year old to come home with a gallon sized bag filled to the brim with Easter candy. Plus, it’s so much fun to make your own! It’s nearly impossible for me to get into the groove of the spring season without making some sort of homemade Easter confection. Chocolate, peanut butter, caramel Easter eggs, and even a boozy concoction or two, have all made an appearance on our news feeds at some point by now, but they all prove coconut is mostly used for a decoration for bunny cakes rather than the star of the show. Imma bout to change all that. 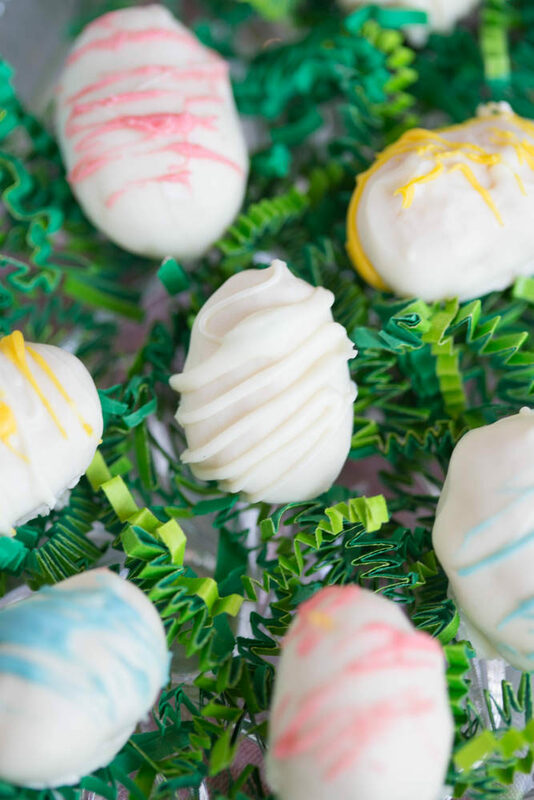 If you’re like me and are one of those people who could bathe in a vat of coconut, then you are going to just love these homemade coconut cream eggs! These little coconutty crack bombs are going to change your life. They are so super easy to make and would be a great way to get your kids (or who ever you like) involved in the kitchen over the holiday. Zsoosh the unsweetened coconut, coconut oil, coconut butter, vanilla and honey in a food processor or blender, roll them in your hands then dunk them in melted white chocolate. That’s it! I mean, who wouldn’t have fun doing that? Honestly though these coconut cream eggs aren’t just an Easter candy either. You could always just put them into molds so you can make them all year long. Because they’re so easy, they don’t have to be one of those fancy, schmancy recipes you only bust out on special occasions. 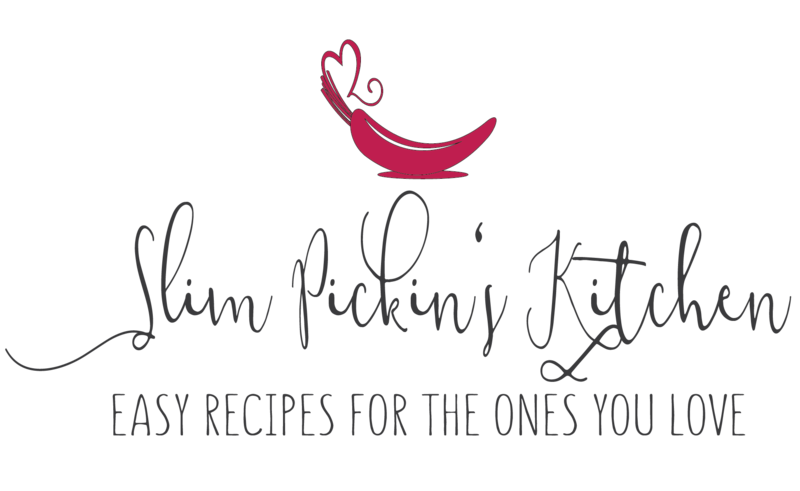 Make them for your kids, a church potluck, for your grandparents sick next door neighbor or as a super special treat you stash in the freezer for yourself on those days when you just need a quick escape to the tropics. 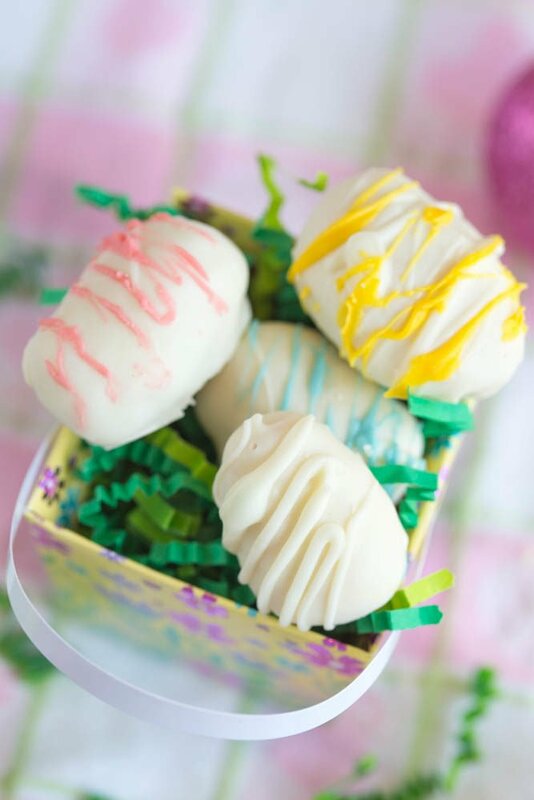 White Chocolate Coconut Cream Eggs are an eggscellent, clean eating sweet treat that you won't feel bad about serving to your kids! Tropical, unsweetened coconut is blended with thick coconut butter, coconut oil, sweet honey, and a kiss of vanilla making these a delicious and decadent dessert that's practically good for you! Line a baking sheet w/ parchment or wax paper. Set aside. Add all ingredients to a food processor or blender and give it a whirl until the mixture is well mixed and starts to stick together. Shape coconut mixture into 1 inch ovals or egg shapes and place back on the baking sheet. Once all eggs are shaped, coat them each in white chocolate then place back on the baking sheet. Decorate them as you wish with sprinkles, colored icing or extra white chocolate. 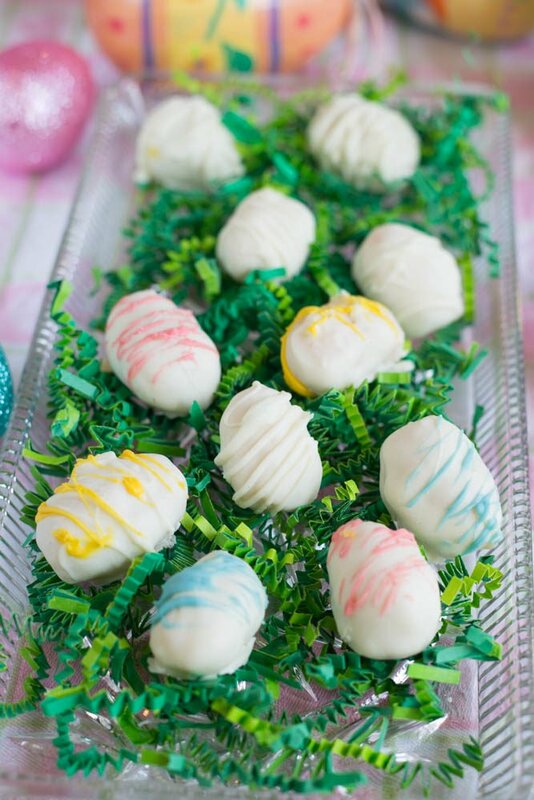 Freeze or refrigerate the eggs for 10-15 minutes or until the white chocolate is completely set. Store in an airtight container until they're all gone. Trust me, they won't last long! If using white chocolate chips: Add chocolate chips to a heat proof bowl and adjust your microwave settings to 50 percent strength. Heat the white chocolate for 30 seconds,stir, then continue to heat and stir in 30 second intervals until completely melted. If the white chocolate isn't smooth enough, add 1 tsp of coconut oil to make it smoother. If using almond bark or melting wafers: Follow melting instructions on the package. I use the unsweetned. It is dry, but the coconut oil and butter help moisten it!